Scientists have confirmed for the first time that radical changes of one volcano in southern Japan was the direct result of an erupting volcano 22 kilometers (13.7 miles) away. The observations from the two volcanos—Aira caldera and Kirishima—show that the two were connected through a common subterranean magma source in the months leading up to the 2011 eruption of Kirishima. 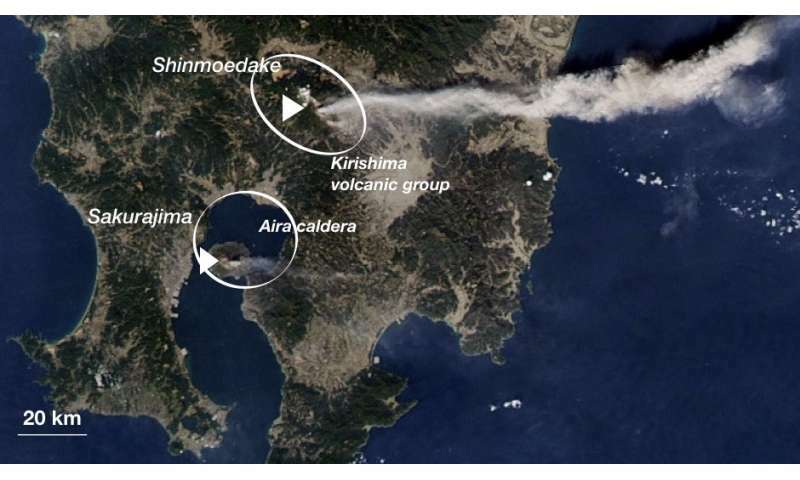 The study, titled "Geodetic evidence for interconnectivity between Aira and Kirishima magmatic systems, Japan," was published June 28 in the journal Scientific Reports. If you go to Volcanoes of the World Maps, you see them all pretty close to the Sea Shores; So, Try pumping in Sea Water as a Test, carefully testing simultaneously for negative results, if any. My Assumption is that we will get free fresh water as rains and hydrothermal energy along with them, simultaneously. If scared of doing that, pump same sea water into deserts to convert them back to Forests. I am surprised that no super scientists had suggested this before ! Run series of discharged batteries high above volcanoes to charge them back ! Also, many volcanoes are NOT close to the sea shore. If scared of doing that, pump same sea water into deserts to convert them back to Forests. I am surprised that no super scientists had suggested this before ! They haven't suggested it, as it won't work, because of all the salt in sea water. Dear bettingexistence, you need to get yourself to Gamblers Anonymous. Check out the results of seawater and active volcanoes such as the recent Kilauea event. Especially the history of Iceland and Hawaii. The poisonous gases released from mixing seawater and flowing lava have had harsh consequences for the people of both island nations. Also, while you're at it? Check with hydraulic engineers and maritime engineers. About their continuing struggle trying to deal with the corrosive effects of seawater on ships propellers, pipes, pumps and other machinery. "It is always an education to step outside your knowledge base and learn something new!" We cannot prevent Rains or Hurricanes over Volcanoes - So, Aerial Vehicles should drop huge amounts of water over them and see whether there will be any negative effects. It can be increased gradully, not all of a sudden. Read About Hydrothermal Explosions in the following link ! Old Faithful geyser : Climate and Weather for Yellowstone National Park. All months are liable to see quite heavy precipitation, and this is spread fairly evenly throughout the year apart from July, the driest month. Say are you that pinhead who used to insist we could cool off Yellowstone with geothermal power plants?